$35 maximum cash back on watches, jewelry and other special Deal items. Cash back inquiries can ONLY be accepted for orders placed after November 24, 2014. Cash back is valid on up to 3 orders per month for both Jomashop.com and JomaDeals.com.Cash back is available for United States orders only. Any sale that remains open for Jomadeals.com and orders that have not shipped within 10 days from order date will not be eligible for cash back. 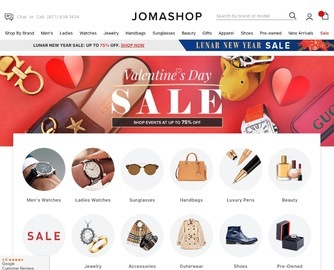 Jomashop reserves the right to reverse any sales that have used any unauthorized coupon codes or sales that have already been attributed to other online marketing channels in Jomashop's full discretion. Using any coupon codes you do not see on this page will void the commission. No cashback on gift cards. Click a Coupon or click Start Shopping to earn Up to 0.5% Cash Back at JomaShop.